In a month or so I may be looking forward to fresh peas and longing for tomatoes, but right now I am excited by the falling snow and this crunchy endive salad. It’s ready in 5 minutes and made a perfect lunch yesterday. Cut off endive stub and remove one outer layer of leaves. Rinse quickly under running water, shake dry, and slice crosswise into 1/2 inch (1 cm) pieces. Wash apple, cut into quarters, core, and slice quarters thinly crosswise. 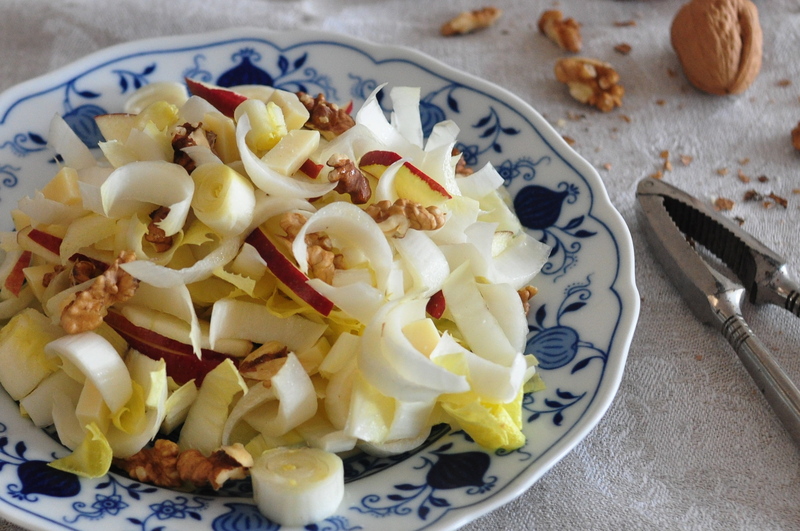 Immediately toss the endive and apple with the juice from 1/2 a lemon, as they oxidize quickly. Shell the walnuts and break them into pieces. Cut the cheese into strips about 1 in (2.5 cm) long and 1/3 inch (1 cm) wide. There should be about as much cheese as there are walnuts. 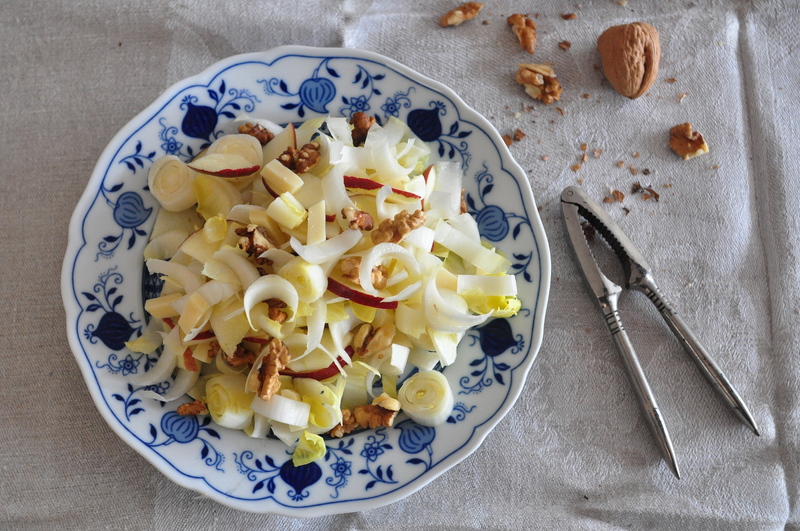 Mix the walnuts and cheese with the endive and apple. Season with the olive oil, vinegar, salt, and pepper and toss well. This entry was posted on 27 January 2011 at 10:24 and is filed under Salad, Thanksgiving, Winter, Winter salad. You can follow any responses to this entry through the RSS 2.0 feed. You can skip to the end and leave a response. Pinging is currently not allowed. Beautiful combination of flavors, especially the apple and walnut. I’m headed to the grocery store and will have to add these ingredients to my list! Thank you, Tess, glad you liked the combination. It’s a childhood memory and still a favorite! great recipe….I just loved the combo ! Always a winner, specially made by you my dear!